Thus, he says, Russia could return to their noble past when there was tremendous devotion of Our Blessed Mother as a means of expressing faith in God. What a great idea! It sounds so simple, but it is again another tactic of the progressivists to deviate from the true message of Fatima. Since the Cardinal brought up the topic, it seems like a perfect time to review the most tragic and devastating decisions of the Catholic Hierarchy in History when it disobeyed and continues to reject God and His request to consecrate Russia to the Immaculate Heart of Mary. The rejection of the Fatima message by the Hierarchy of the Church began as early as 1930 when Pius XI failed to respond to the request to consecrate Russia. It has continued for the next 87 years. The purpose of the consecration – drawn from Our Lady’s words in 1917 – was to prevent “a worse war from breaking out under Pius XI.” One day Lucy asked Jacinta what she was thinking. Her reply: "About the war that is coming. So many people are going to die, and almost all of them are going to Hell." The consequences of King Louis XIV ignoring the command to consecrate the country to the Sacred Heart given through St. Margaret Mary Alocoque are well known parts of the history of the French Revolution: Louis XVI lost his crown and, three years later, his head to the guillotine. 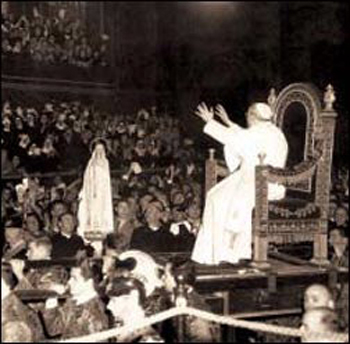 We can only speculate that, following the example of the King, Our Lord meant that the Chair of Rome will be destroyed and transferred to Fatima, as recently published as the deciphered version of the Third Secret. At Fatima during the 100-year anniversary, Francis announced that he was the “the bishop dressed in white,” who according to Vatican-released version of the Third Secret, is killed along with other religious on a mountain top. The Message of Fatima released on June 26, 2000, stated that the third part of the secret was not a future event, but was a prophetic vision, similar to those in Sacred History. This raises a question: Should Francis not be worrying? The Vatican has held that John Paul II is the “bishop dressed in white” and the attempt on his life in 1981 fulfilled that prophecy. Was Francis being sarcastic? He does not have any respect for traditional Catholics and for those who closely follow Fatima. Or per chance does he know that the order to move the Chair of Peter to Fatima was announced when the Secret was published and that, in less than 69 weeks, Rome will be destroyed if it continues its abomination? In 1918, Benedict XV established the policy of “compromise and conciliation,“ Ostpolitik – opening relations with the communist Eastern bloc – completely changing the non-conciliatory approach of St. Pius X, who resolutely condemned Marxism-Leninism. This policy has been adopted by the Vatican for the vast majority of the past 100 years. 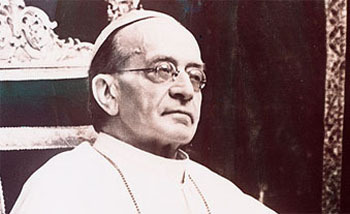 Pius XI followed Benedict XV in protesting the communist persecution of the Church, but not condemning Communism, and he did not sever Vatican diplomatic relations with Moscow. Diplomatic relations continued, even though the Soviet government had annihilated the Catholic Hierarchy; burned churches, martyred Bishops and created a famine to deliberately starve to death milllions of its own citizens between 1929-1932. In 1933 that Ostpolitik was abandoned, not because of all the atrocities, but because Pius XI discovered that the communists had been lying to him. Although Pius XI changed his tune about Communism, branding it as “intrinsically perverted” and a “tragedy to humanity,” he never consecrated Russia to prevent World War II, in which over 80 million people were killed and resulted in the errors of Russia being spread over half of the world. It didn’t take long for Ostpolitik to resurface. In October 1962, just before the start of Vatican II, the Vatican signed the Metz Pact with Moscow stating that the Council would not condemn Soviet Russia or Communism in general, in exchange for which two Russian "Orthodox" were "allowed" to attend the Council. As Secretary of State the future Paul VI set up secret channels with Moscow and other communist Heads of State, tipped off the Russians when priests tried to enter Russia (and were consequently murdered), and humiliated Card. Mindszenty before the world. Further, he left hundreds of thousands of Catholics in the communist labor camps and under torture without any solemn protest in order to continue the Vatican Ostpolitik. In his interview Card. Burke admitted that “compromise and conciliation” remained the policy of the Vatican when he said that John Paul II wanted to consecrate Russia on March 25, 1984, but in order to promote friendlier relationships with the communist countries, the name Russia was not to be mentioned. 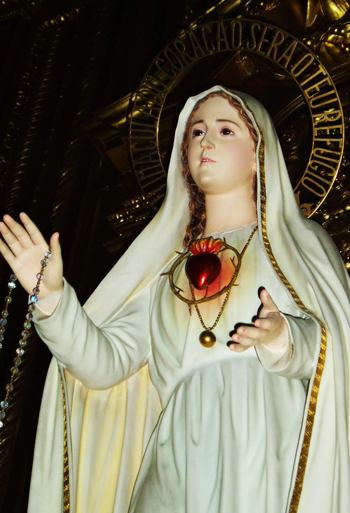 On June 26, 2000, the Church said its formal good-bye to Fatima by issuing The Message of Fatima, which is a final report with lies from the first sentence, and placidly sets aside the warnings of the Mother of God, announcing that the Fatima message is complete and over. Earlier that same month, John Paul II had further humiliated Our Lady by warmly welcoming at the Vatican Russian President Vladimir Putin. 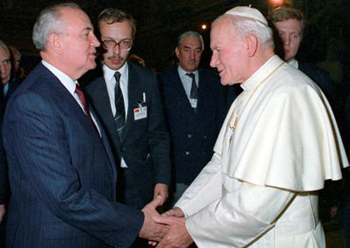 a promoter of the “errors of Russia.” In 1989, this same Pope welcomed Mikhail Gorbachev, who was the first Soviet president to meet with the Pope. The communist leader continued to promote abortion and population control but was praised by the Vatican, which refused to denounce the errors of Communism. On March 13, 2007, Benedict XVI also gave an audience to Putin. In July of the same year, Pope Ratzinger sent a letter to the courageous Chinese Catholic resistance against Communism, advising them that the way of the future is to accept and join with the government-sponsored Patriotic Association. The 100-year cycle was completed when Francis denied the message of Fatima on its May 13th 100th anniversary. This is the sad saga of Popes favoring Communism and refusing to follow the directives of the Mother of God.